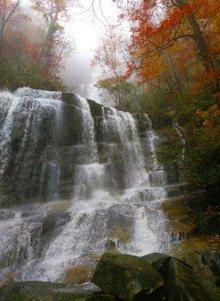 Tucked away in Marietta, SC at Jones Gap State Park, is an immensely beautiful 125′ waterfall, Falls Creek Falls. The 1.7 mile out and back hike is strenuous as it ascends approximately 600 feet with a few flat stretches thrown in the mix. But it is worth every bit of effort. This moderately hiked trail is often overlooked, making it one of my favorite spots. I love of having the solitude of enjoying the trail with just myself and my dog. That’s right, it’s dog friendly! The trail head is roughly 45 minutes from Greenville, SC depending on your location, making it a great local option for an afternoon trip. I highly recommend this impressive local gem. I guarantee that will not be disappointed, but maybe a little sore and in awe of what South Carolina has to offer. Directions: Head north on US 276 from Greenville (you will pass SC 11 Junction). Turn right on River Falls Road; then go 4 miles. Turn right on Duckworth Road; then go a 1/2 mile. Turn right on Falls Creek Falls Road.Trailhead is down on your left with parking.